Like the Casserole, the Oval Casserole is perfect for slow cooking soups, stews, and casseroles. Their flat bottom shape are well suited for gas or electric ranges, and perfect for placing in an oven for finishing stews or rice dishes. Its oval shape provides more room and can even accommodate whole poultry for dishes such as Korean Whole Chicken Ginseng Soup. Since clay is a natural and porous material, it does not react with the food and cause a slow evaporation of steam from the pores. The moist enclosed interior results in food that is healthier, tastier and moist requiring less fat and liquids. The beautiful black finish makes for a great presentation for family style service. The peices retain heat for a long period of time, so be careful in handling a hot pot. The video to the right shows a pot which has been brought to the table, yet keeps bubbling for quite some time without any heat source. 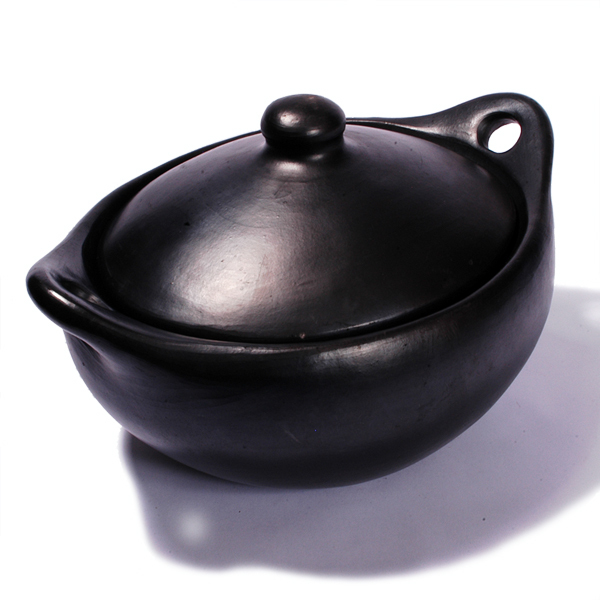 An essential part of the Colombian Bandeja Paisa are the beans, and nothing like beans cooked in a clay pot. The recipe calls for Cargamanto beans. If you are lucky enough to live by a Colombian grocery store, or a Latin grocery that carries them, you are in for a treat of the best beans you have ever had. If you can’t find them, try Bola Roja, or at last resort, Red Kidney Beans or another Small Red Beans. One of my favorite kitchen items, I own a couple of these things and love cooking with them. They do require more care and initial sealing. I usually boil a mix of milk and water in mine and have not had a problem. I believe you can also boil plantains in them as well to do the sealing. Once you seal them, they have alway been easy for me to clean. I just use a scrubby sponge with no soap and hot water. When I first bought them I had a gas stove, now I have an electric...I will admit, they work better on gas. I have yet to find a good diffuser for the electric stove. They say you can use them directly on the electric burner, but I am not convinced that clay on the burner is a great idea, and they recommend that you use a diffuser. They are not recommended for glass top stoves and induction would not work without a suitable diffuser. Be aware that these are handmade items...the lids don`t fit exactly perfect and the sizes are estimated. I use mine in oven now more than anything...one thing you need to keep in mind is that you should not put these in a pre-heated oven. If you have a recipe that requires the oven to be pre-heated, this is not the container to use. For stews and casseroles that you can put in the oven as it is heating, you are golden. I am very satisfied with the product and the experience of the purchase. Excellent to back with, stew turned out great, meat was very tender. Beautiful bakeware, goes straight from the oven to the table and looks "classy".